Alan A. Armer was a writer, director, and producer of great prominence in the history of American television. He taught screenwriting and directing at California State University, Northridge for eighteen years, for which he won the university’s “Distinguished Teaching Award.” He made an extraordinarily generous donation of $1 million to CSUN for a state-of-the-art screening room, the largest gift ever received from a faculty member. With a B.A. in speech and drama from Stanford University, and a M.A. 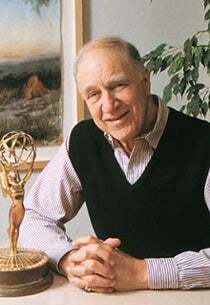 in Theatre Arts from UCLA, Alan Armer was a pioneer in early television by writing, producing, and directing over 350 television movies or series episodes for NBC and ABC—from symphony orchestra broadcasts to the historically significant Matinee Theater, a daily one-hour network dramatic program. As the EMMY award-winning producer of The Untouchables and The Fugitive, Alan Armer has, in his eloquent narratives, confronted those who seek to pervert the American Dream, and has poignantly expressed the alienation, guilt, redemption, and salvation that are intimate factors in the dream’s preservation. It has been said that the tension between nightmare and dream is the fundamental theme of the American culture. Taken as a whole, our media provide a continuing negotiation between the real and the ideal, between our lives and our dreams of transcendence, between our own shortcomings and aspirations and the shortcomings and aspirations of our country. In the iconic television series—in a heightened and imaginative way—Dr. Richard Kimble’s life as a fugitive, an innocent man who was totally powerless, relates to this sense of deep alienation and anxiety. Indeed, internationally, 70 countries took up the cause of Richard Kimble, a character who seized the collective human spirit. For 13 years, the final episode of The Fugitive held the record for the highest-rated broadcast in television history. For his work on The Fugitive, Alan Armer won the EMMY, television’s most coveted award, from the Academy of Television Arts & Sciences, and was nominated for this award on multiple other occasions. He won the Producers Guild Award for The Untouchables, and in March 2000, Mr. Armer was inducted into the Producers Guild of America’s Hall of Fame. The years that he devoted to teaching suggest that Alan Armer’s vision of human experience extended beyond the professional parameters of a Hollywood career. Perhaps the most selfless contribution that Alan Armer has made to media students and the general California State University, Northridge community is his and his wife Elaine’s donation of $1 million for a 130-seat screening room in Manzanita Hall. Mr. Armer said he chose to make the gift largely because of the fun he had teaching at CSUN. In 2002, in recognition of his many contributions to cinema and television, to the advancement of young artists, and to the California State University, the Board of Trustees of the California State University and California State University, Northridge conferred on Alan Armer the honorary degree of Doctor of Humane Letters. In his teaching and in his professional work, Alan Armer attempts to have reality conform to the dream—even when, in the process, the feat sometimes seems supremely difficult, if not impossible. Under Mr. Armer’s influence, his fictional protagonists and his real students negotiate between themselves and their ambitions, trying to discover who they are and find what character really is. It’s the quest that’s American.